A strong local economy has been an important pursuit for Oregon Rural Action members since the organization’s founding. We are working to overcome the challenges faced by many rural communities which have for so long been dependent on resource-based export economies. Through the sustainable utilization of the resources within in our own communities through various approaches - some innovative, some time-worn - we firmly believe that we can have strong rural economies wherein all can share the abundance. Every dollar we spend has the power to influence our community. Whether we realize it or not, we are shaping the world we live in each time we make a purchase or pay for services. Oregon Rural Action members have joined countless others across the nation in prioritizing and promoting local products and services as a way to make sure money and resources stay within our communities. In the wake of the economic collapse in 2008-2009, a movement emerged to establish a bank that would be accountable to the citizens of Oregon, rather than Wall Street executives. As Jared Gardner, Co-Chair of Oregonians for a State Bank, put it, “We believe that the Oregon State Bank can play a large role in creating a more resilient local economy and getting credit flowing to small business and farmers.” Oregon Rural Action members played a strong role in the effort, and though it has not yet succeeded, it continues to pose a powerful option for our state’s financial investments. 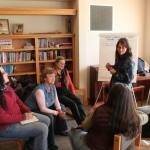 In 2009 and 2010, we sponsored workshops at our annual meeting and in five counties in Eastern Oregon to utilize a community-based process for attaining short- and long-term sources of revenue and employment by identifying local resources, engaging local initiative and talent, and designing a locally endorsed and sponsored vision of community quality of life. This process is known as building community wealth and the ideas that emerged – as well as the new and surprising relationships – were inspiring.